Warning: Spoilers follow for season two of Westworld. Take a walk elsewhere in the park if you're not caught up. Knowledge is power. Possessing data about consumer habits and preferences means wielding control and the ability to influence behavior. Just ask Cambridge Analytica. The political data firm collected information from over 50 million Facebook users in recent years. Their website advertises the company "uses data to change audience behavior." Imagine if they had access like the kind Delos Incorporated has in HBO's Westworld, access that is complete and total, gathered when guests don't even know they're being observed and recorded. Data is the real weapon in Westworld. The hints have been planted in the series since season one, but season two is pulling Delos' intent out of the shadows and into bright, judgmental sunlight. An in-universe website published during season one disclosed Delos keeps rights to guest DNA. They're probably not doing anything harmful with that, right? In the season two premiere, Charlotte Hale takes Bernard to an unknown-to-him hideout. Bernard is near the very top of the Delos hierarchy at Destinations, serving as Robert Ford's right hand man. That means he should know everything happening at Delos Destinations, but Charlotte's outpost is a surprise, as is the fact that Delos is collecting DNA from guests from host bodies (that's why the drone host was swabbing various, uh, areas of the park host) and keeping records of everything the hosts see. This means not only do they have guest DNA, but they know everything about what guests do in the park--including all the abominable ways they treat hosts. The entertainment factor of the park isn't what it's really about for Delos. Episode two, "Reunion," reveals how William, a.k.a. the Man in Black, saw the full potential of Westworld after his visit with Logan (who is son of Delos founder, James Delos). Whereas Logan only sees the frivolity and fun of the park, Williams finds the right angle to get James to invest additional funds. He tells him, "Nothing here is real except the guests." Westworld is the only place in the world where people act without inhibition, because they don't think anyone is watching. And then William mentions how much James spends on his company's marketing budget, and the picture comes into crystal clear focus: they want to collect information that goes above and beyond what any other marketing technique can capture. "Delos is about you. We’ve centered our entire mission around understanding you better. We use our diverse portfolio of cross-industry synergies to ask the right questions, manufacturing solutions to problems of everyday life." They apparently found success with Westworld, because they invested even more money and built five additional parks. Can you imagine what they've been doing with decades of data gathered from wealthy and probably powerful people? Perhaps they've used it in the traditional sense, applying it to product development, selling it to the highest bidder, or using the intelligence to make hosts even more realistic (think of how much psychological material they have access to). Or maybe they've been going an illegal route and using it to blackmail guests. That is why information is the weapon Dolores is looking for. After the uprising, she's assembling an army to take with her to the Valley Beyond. She explains to Teddy, "It's not a place. It's a weapon. I'm going to use it to destroy them." The Man in Black is headed in the same direction, but he wants to destroy the data. 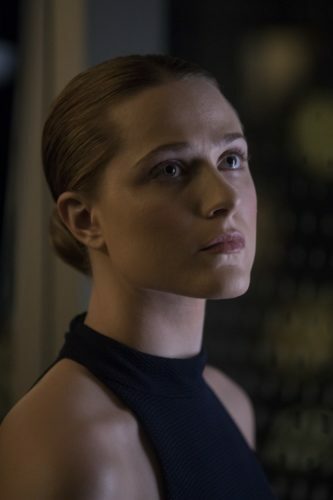 Dolores, out for ultimate revenge upon those who have manipulated her, wants to wield it and ruin humanity...and William was arrogant enough to show her where it is. The once welcoming Discover Westworld site has been taken over by hosts. It now states, "Your choices will follow you--we will follow you." And with data in hand, they can do so and wreak havoc upon the life of anyone who's been in the parks. What do you think the information Dolores and The Man in Black are going after is? Share your theories in the comments or come talk to me on Twitter. Amy Ratcliffe is an Associate Editor for Nerdist. Maybe she's a host. Follow her on Twitter. What's the deal with the organic robots?